HCI Books - What Will They Say About You When You're Gone? HCI → What Will They Say About You When You're Gone? I'll never forget the call. It was 1989 and, like most college students, I spent winter break in Florida looking for some sun. Stepping off the airplane and being greeted by a burst of warm air was the best. As I entered the terminal, I had the added benefit of being greeted by my maternal grandparents, who lived in North Miami Beach. Lounging at the pool, going on walks with them, or eating out, the experience was a wonderful way to decompress after an intense period of finals. Although being the oldest of six children came with big brother responsibilities, life was great and my worries were minimal. That warm Wednesday afternoon in January, my grandparents and I spent the morning at the pool. We were just coming back when we received a call that would change my life forever: My mother had suffered a brain aneurysm. She was just forty-four years old. We were in a daze. As we tried to comprehend the details, my father conveyed to us that my mother had felt a throbbing pain in her head and, in a whisper, asked him to call an ambulance. She was conscious when they carried her out of the house on a stretcher. In the seven minutes it took to speed through the streets, the only breath my father dared utter was a prayer to God to save his wife, my mother. But before she reached the emergency door, she fell into a coma. We all booked the next flight out of Florida to be with my mother. I couldn't believe what I'd heard. I prayed fervently as we rushed back home and sat vigil by her bedside. To this day, I remember being in the ICU with her, not knowing whether she was dead or alive. I thought I saw her move her eyelids. I held her hand, lingered with her touch, and gave her a kiss on her forehead. How could this be happening? Just yesterday we spoke, she laughed, and now, within forty-eight hours, she'd passed away, leaving her parents, a husband, and six children, ages eight to twenty-one, to mourn her loss. My world—our world—was turned upside down in an instant. I didn't know how I could go on. My mother was my rock and source of strength. How could it be that she was no longer here? I spoke at her funeral in front of hundreds of people in Atlanta, our hometown. She was buried in Israel, as is traditional in Judaism. I woke up in the middle of the night during shivah, the traditional Jewish period of mourning, as I couldn't sleep, and I frantically recorded stories that I remembered, and ones that people had shared, to ensure she wouldn't be forgotten. Although I returned to Yeshiva University after shivah for the spring semester, for days and months, I couldn't fathom the reality of my mom's sudden death. In the middle of class, I couldn't focus and I'd break down and cry. I took great comfort during the year in recording and reading my thoughts at the time of her death and the reflections of our family and friends. Although the pain of my mother's absence will never disappear, I've realized that she is ever present in our lives in ways I never thought possible. Though she is not with me physically, I sense her presence, hear her voice, and feel her guidance and influence every day. There are moments when I may be searching for the right words to share in my role as a congregational rabbi, and if I listen carefully, she serves as a muse. I turn above and offer eternal thanks. Over time, the call I'd received more than twenty-five years ago has evolved into a calling. Her passing instilled within me an acute awareness of the fragility of life and the gift of every day. I live with a heightened sense of urgency to realize my divine potential and to do my utmost every day to harness all of my energy and talents to help other people realize their potential as well. In the past twenty years, I've come to appreciate that my personal awakening motivates me, defines me, and guides me to lead a life of meaning and impact. Through this experience, I discovered that I'm leading my life with greater passion and purpose. Rather than experiencing life in a casual way, I'm driven to maximize every moment. When my mother died at forty-four, I knew she was young. Now that I'm in my forties myself, I think about my own mortality and am even more attuned to the stark reality that every second, every good-bye as someone leaves in the morning, and every milestone graduation or birthday could be the last. In truth, almost everyone experiences such an awakening in their lives. There's a moment in all of our lives when we experience a wake-up call: a moment when the terra firma beneath the normal ebb and flow of life is shaken or stirred. You might call it an inner earthquake. For some it may, God forbid, be a death in the family or a personal illness. For others it may be an awakening due to the birth of a child or grandchild, or a wedding, a recent economic upheaval, the loss of a job, or challenges at work. We want more out of life. The most poignant expression of this deep-seated desire emerges at a funeral when we are confronted with our own mortality. For a brief time, we hear about the life of another person—what they loved, who they touched, what they lived for, who they influenced, and how they'll live on. As we leave the funeral, we ask ourselves, 'How will I be remembered?' We may be reminded about the importance of family and pledge more time with our own or reexamine our friendships or the infinite value of a good name. But by the end of the day, if not sooner, the awakening dissipates or becomes dormant, only to reemerge at another funeral or life-altering event, when, once again, we ask ourselves whether we're maximizing our potential and if we're truly happy and leading a life of impact. At some point, every human being asks themselves these questions, but all too often, the inspiration to act on them wafts away like a cloud on a breezy summer day. Whether rich or poor, black or white, believer or not, the innate desire to lead a life of lasting influence resonates universally. Although I'm an Orthodox rabbi, this book is for people of all faith traditions. Regardless of your personal belief system, we all possess a deep-rooted desire for a life of purpose. I've had the privilege of sharing people's most intimate moments, whether by a bedside in their final moments or guiding families through death and the 'after' life. The final words of a dying person or a eulogy distill our core values into a clear and coherent mission for life. How do we retain the feeling? How do we organize and orient our lives around our inner aspirations and actions every day? This book will help you unlock the secret. It will enrich your life, enhance your relationships, enable you to find inner joy and courage, and help you to pursue the life of your dreams. The concept of reverse engineering your life stems from a belief in your capacity to unlock the divine spark within you. You're endowed with the gift of free choice, and every day and every encounter can be a transformative and eternal moment. How do we reverse engineer our lives? What if we could develop a strategy for living that would ensure a life of influence and impact while simultaneously motivating us to live in the moment? We can understand the process by analyzing the mechanics of reverse engineering a product. In the conventional sense, reverse engineering is defined as the process of discovering the technological principles of a device, object, or system through analysis of its structure, function, and operation. It often involves taking something (e.g., a mechanical device, electronic component, or software program) apart and analyzing its workings in detail, or trying to make a new device or program that does the same thing without using or simply duplicating (without understanding) the original. Imagine yourself as the CEO of a budding beverage company. On a trip to the Far East, you discover a 'no calorie' drink that leaves you feeling like it's the best drink on Earth. You want to replicate the product and market it in the United States. You purchase a few cases and ship them back to your laboratory at corporate headquarters. You're ready to start your venture. The process of duplication contains three steps. 1. Analyze the ingredients of the beverage. 2. Develop a formula based on your findings. 3. Develop the new drink based on the recipe to produce a new, refreshing product. What if we could reverse engineer our lives? What if we could develop principles for living that would ensure a life of influence and impact while simultaneously motivating us to live in the moment? That is the mission of this book. Having officiated at hundreds of funerals, sat at the bedside of the dying, and reflected on the value of a meaningful life, I've developed seven principles for reverse engineering your life. In Chapter 1, 'How Do You Want to Be Remembered?,' you'll learn how to build a prototype of the life you aspire to lead. As in the process of scientific engineering, your model will be a 3-D one. Through a process of discovery, you'll be able to design a life to achieve your destiny. Once you envision the life of your dreams, in Chapters 2–8, we'll explore each of the seven principles in detail, be inspired by real-life stories, and gain hands-on tools to help you along the way. In the past few years, I've shared the concept of applying reverse engineering to our personal lives with many people. The thirst for such a path is palpable. We live in a world that moves at lightning speed, and we know that we miss many moments and relationships that should be cherished. As a community, we're heartened when we witness acts of personal heroism and devotion to family, and we wish these exceptions were the norm. The seven principles will provide a road map for you. 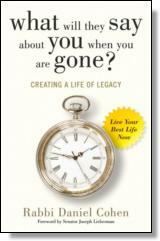 Through the process of developing your best self by embracing these principles, you'll be able to start living the life now for which you want to be remembered after you're gone—your legacy. I challenge you to dig deep into your life. You're blessed with inherent gifts, and your life is trademarked. There is only one you. This book will enable you to discover the brand secret within you and motivate you to be your very best self. Not only will you experience more joy, meaning, and happiness, but you'll positively impact your friends and community in ways that will establish your personal legacy now and forever. ©2017 Rabbi Daniel Cohen. All rights reserved. Reprinted from What Will They Say About You When You're Gone? : Creating a Life of Legacy. No part of this publication may be reproduced, stored in a retrieval system or transmitted in any form or by any means, without the written permission of the publisher. Publisher: Health Communications, Inc., 3201 SW 15th Street, Deerfield Beach, FL 33442. Whether a mentor, guide, cheerleader, or motivator, Rabbi Daniel Cohen possesses a unique blend of authenticity, wisdom and spiritual insight for contemporary society. His personal experience as a Rabbi, sharing hundreds of life affirming moments from birth to death, cultivating thousands of years of Jewish wisdom and as a husband and father of six daughters, combined with his humor and humanity, provide him with a compelling narrative and navigational guide of your life. Rabbi Cohen has served in the rabbinate for over twenty years and currently serves as senior Rabbi at Congregation Agudath Sholom in Stamford, CT, the largest modern orthodox synagogue in New England. He is also co-host with Reverend Greg Doll of the nationally syndicated radio show "The Rabbi and the Reverend" Sunday evenings at 9 PM. http://gabradionetwork.com/programs/the-rabbi-and-the-reverend.